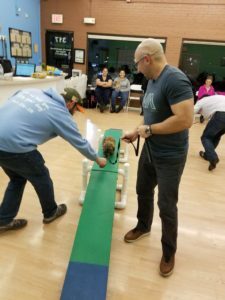 If you’ve been following Dog Training Now’s social media feeds recently, you’re doubtless a fan of Ari. 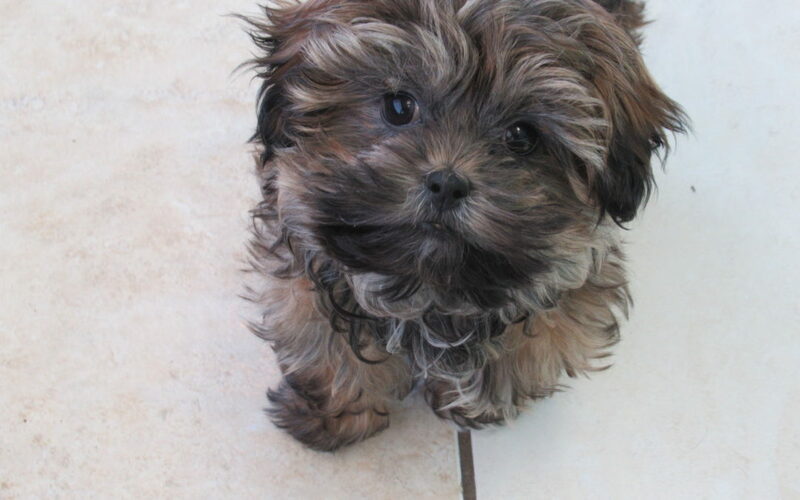 He’s a little Shih Poo who’s been coming to DTN with his owners Kelly and Art since he was only 10 weeks old. 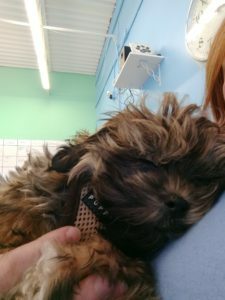 Kelly and Art are both first-time dog owners, and to quote Kelly in her first contact with us “We are brand new puppy owners and a nervous wreck!”. 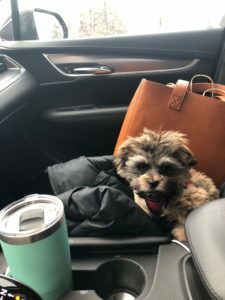 Since that time in late January, Kelly and Art have taken Ari through Puppy Preschool, Puppy Day Camp, a 10-Day Day Training program, and now have him enrolled in our Graduate Training Academy for the entire month of April! They’ve taken nearly the entire DTN journey, and they’re now much more confident dog parents. We’re so impressed with the work that they’ve done, we felt it was appropriate to acknowledge them as our April 2018 Client of the Month. 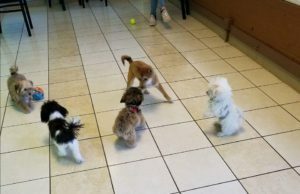 Ari started his Dog Training Now journey in our awesome Puppy Preschool class. 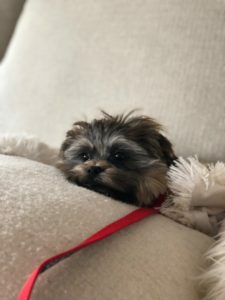 This group class is a great start for new puppy owners because not only is it a great way to socialize your puppy with the world and build self-confidence, it’s also a great resource for new puppy owners. Kelly and Art took advantage of the opportunity to work with our full staff of trainers to answer all of the questions they had about how to best roll Ari into their family and prepare him for a good life. 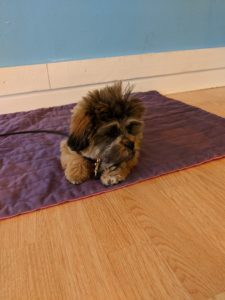 “We began with puppy school on Thursday nights and boy was it fun! Letting us and other “parents” mingle and ask questions as much as the puppies getting to learn one another. It was the first night we met the almost entire staff of DTN we knew we had made the right choice. No question was to big or silly to ask. 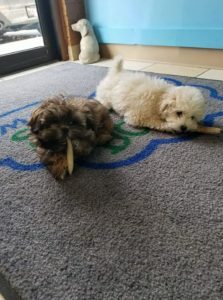 They were patient and kind in explaining the reality of what puppyhood had in store for us”. 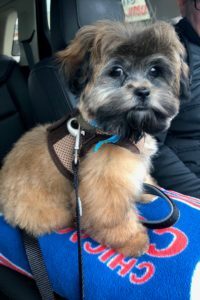 We knew they were going to be fun clients to work with when Kelly emailed before signing up for Puppy Preschool asking “Is there any reason to be concerned because he is so little? 2.5lbs will he be eaten up ?”. Ari taking a break from play time to chew on his antler. Ari in the middle of a great play time! Ari fell asleep in Amy’s arms after a busy play session. 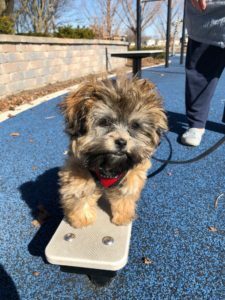 When Ari reached 16 weeks of age, he was eligible for an obedience training program, and Kelly and Art chose to enroll him in our 10-Day Day Training program as soon as he graduated from Puppy Preschool. 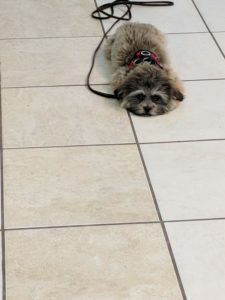 Because he had spent time with us in Puppy Day Camp, Ari was immediately confident and ready for training when he began. 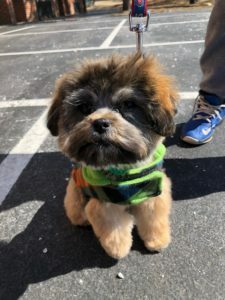 “Every day we arrived to pick him up we were impressed with the skills and progress he would make in learning new commands. 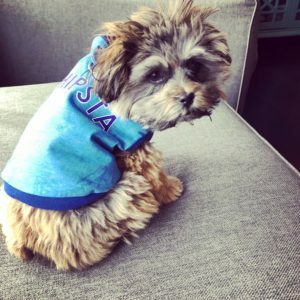 Quickly in this time he learned several basic commands that are the foundation for dog life. We must have asked a million questions to the staff at DTN and everytime we found helpful tips and tricks”. Ari working on the “place” command. The down and stay! So much self-control! Now, Ari is still coming to DTN every day as a member of our Graduate Training Academy. We’re working on making his skills even stronger, and of course building even more confidence! Kelly wrote “We are thrilled with the staff at DTN and thrilled that Ari was welcomed in such a big way that we couldn’t find anywhere else. Ari is just as excited today as he was the first day to greet everyone with kisses. He is very well behaved and socialized something we realize we will continue to work on with the tools DTN gave us!”. Ari, Kelly, and Art have not only been great clients, but they’ve become friends! We appreciate you guys so much! Now, for a dose of Ari out cuting-it-up in the real world! Get the most out of your visit to the dog park!